Finally, A Map Of All The Microbes On Your Body : Shots - Health News The human body contains about 100 trillion cells, but only maybe one in 10 of those cells is actually human. The rest are from bacteria, viruses and other microorganisms. Now, scientists have unveiled the first survey the "human microbiome," which includes 10,000 species and more than 8 million genes. Scientists Wednesday unveiled the first catalog of the bacteria, viruses and other microorganisms that populate every nook and cranny of the human body. Researchers hope the advance marks an important step towards understanding how microbes help make humans human. The human body contains about 100 trillion cells, but only maybe one in 10 of those cells is actually — human. The rest are from bacteria, viruses and other microorganisms. "The human we see in the mirror is made up of more microbes than human," said Lita Proctor of the National Institutes of Health, who's leading the Human Microbiome Project. "The definition of a human microbiome is all the microbial microbes that live in and on our bodies but also all the genes — all the metabolic capabilities they bring to supporting human health," she said. These microbes aren't just along for the ride. They're there for a reason. We have a symbiotic relationship with them — we give them a place to live, and they help keep us alive. "They belong in and on our bodies; they help support our health; they help digest our food and provide many kinds of protective mechanisms for human health," Protor said. Microbes extract vitamins and other nutrients we need to survive, teach our immune systems how to recognize dangerous invaders and even produce helpful anti-inflammatory compounds and chemicals that fight off other bugs that could make us sick. "These microbes are part of our evolution. As far as we can tell, they are very important in human health and probably very important in human disease as well," said Martin Blaser of New York University. These bugs generally don't make us sick. But when we disrupt the delicate ecosystems they carefully construct in different parts of our bodies, scientists think that can make us sick. "There can be a disturbance in the immune system. There can become some kind of imbalance. And then you can get a microorganism which, under normal circumstances, lives in a benign way and can become a disease-bearing organism," Proctor said. Taking too many antibiotics, our obsession with cleanliness and even maybe the increase in babies being delivered by Caesarean section may disrupt the normal microbiome, she said. So the idea behind the micobiome project was to get the first map of what a normal, healthy microbiome looks like. More than 200 scientists spent five years analyzing samples from more than 200 healthy adults. The samples came from 18 different places on their bodies, including their mouths, noses, guts, behind each ear and inside each elbow. "This is the only study to date anywhere in the world where peoples' microbiomes across a human body were sampled and analyzed. Here was an effort to really investigate the full landscape, if you will, of the human microbiome across the body," Proctor said. Scientists identified some 10,000 species of microbes, including many never seen before, according to the first wave of results, which are being published in 16 papers in the journals Nature and PLoS. "This is like going into uncharted territory — going into a forest and finding a new species of butterfly or new type of mammal or something like that — a new kind of bird," said George Weinstock of Washington University in St. Louis. 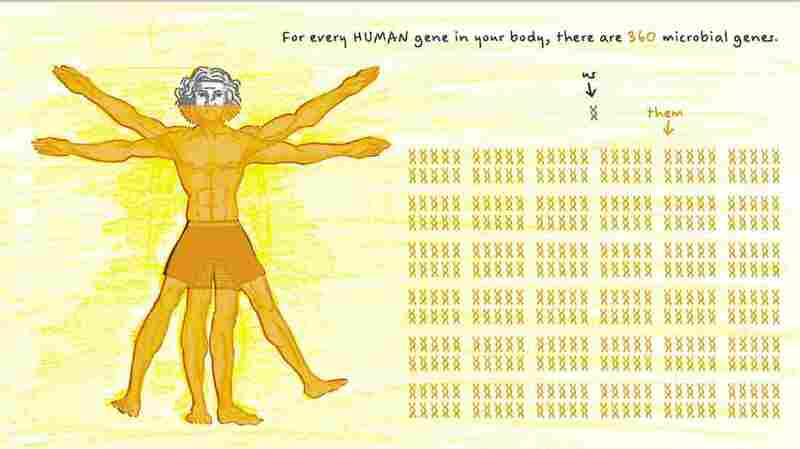 Those 10,000 or so species have more than 8 million genes, which is more than 300 times the number of human genes. And scientists found some very interesting things when comparing microbiomes. "People were very different from each other, but skin was more like skin and gut was more like gut. So the composition of microbes and the kinds of genes that they have are very much habitat-specific," Proctor said. Now that scientists have an idea of what a healthy microbiome looks like, they can start to explore this super-organism — this complex mishmash of human and microbial cells. "How do they talk to our human cells? And how do human cells talk back to them? Because it's really a concert that they're playing together, and that's what makes us who we are," Weinstock said. Scientists have already discovered some intriguing clues. For example, the microbes in a pregnant woman's birth canal start to change just before she gives birth. Scientists think that's so their babies are born with just the right microbiome they'll need to live long, healthy lives.